Guo Jin’s paintings explore the concept of time, passing or suspended, and the human relation to it. 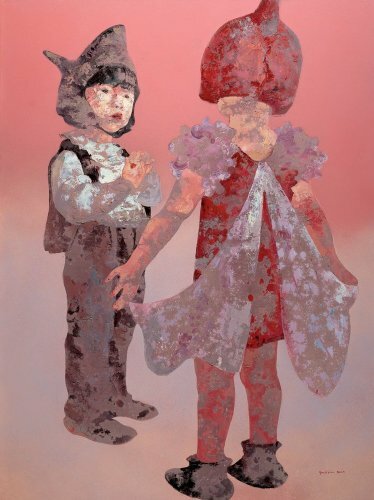 In his portrayals of children, the series he is most famous for, Guo Jin depicts children at play, dressed up, performing, self-expressed and care-free. The artist aims to illustrate naivete and innocence, ideals children retain but which are lost in adulthood. The absence of concrete background elements remove the protagonists from a fixed point in space and time, creating surreal environments, as if in a fable. The pastel colours (mainly purple, red and blue) chosen by the artist connote grace and purity. 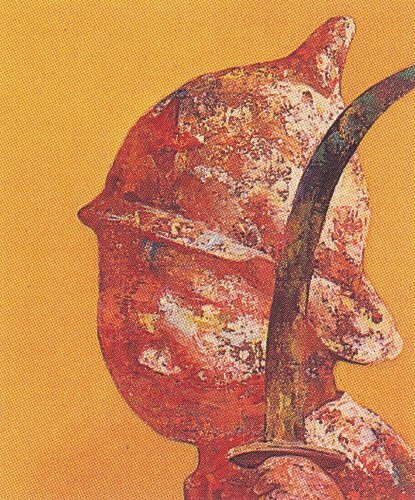 However, a sense of nostalgia is conveyed through his technique, which creates a rusted look, by varying the many layers of paint and the addition of foreign materials. His style and subject matter differentiate him from the usual symbolism adopted by movements in contemporary Chinese art such as ‘Cynical Realism’ or ‘Political Pop.’ Guo Jin still creates in this cultural context, the one of Western China, as he lives, works and teaches between Chengdu and Chongqing. His recent works convey the evolution and maturity of this earlier rendering of innocence lost. 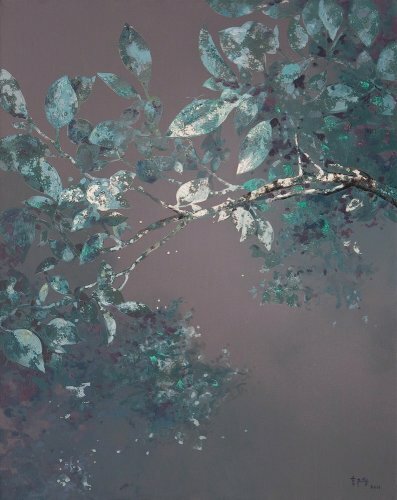 Guo Jin has returned to the tradition of painting landscapes: portraying nature, trees, branches, animals, fishes, void of human presence and non conducive of existential questions.